I've been working too hard, and running around too much, to write This Week's Finds for a while. A bunch of stuff has built up that I want to explain. Luckily I've been running around explaining stuff - higher gauge theory, and tales of the dodecahedron. This weekend I went to Baton Rouge. I was invited to Louisiana State University by Jorge Pullin of loop quantum gravity fame, and I used the opportunity to get a look at LIGO - the Laser Interferometry Gravitational-Wave Observatory! Laser beams bounce back and forth between mirrors suspended at the ends of the tubes, looking for tiny changes in their distance that would indicate a gravitational wave passing through, stretching or squashing space. And when I say "tiny", I mean smaller than the radius of a proton! This is serious stuff. Jorge drove me in his SUV to Livingston, a tiny town about 20 minutes from Baton Rouge. While he runs the gravity program at Louisiana State University, which has links to LIGO, he isn't officially part the LIGO team. His wife is. When I first met Gabriela Gonzalez, she was studying the Brownian motion of torsion pendulums. The mirrors in LIGO are hung on pendulums made of quartz wire, to minimize the effect of vibrations. But, the random jittering of atoms due to thermal noise still affects these pendulums. She was studying this noise to see its effect on the accuracy of the experiment. 1) The LIGO Scientific Collaboration, Analysis of LIGO data for gravitational waves from binary neutron stars, Phys. Rev. D69 (2004), 122001. Also available at gr-qc/0308069. She's one of the folks with an intimate knowledge of the experimental setup, who keeps the theorists' feet on the ground while they stare up into the sky. Now they can operate LIGO day and night. I also asked him how close LIGO had come to the sensitivity levels they were seeking. When I wrote "week189", during the first science run, they still had a long way to go. That's why the above paper only sets upper limits on neutron star collisions within 180 kiloparsecs. This only reaches out to the corona of the Milky Way - which includes the Small and Large Magellanic Clouds. We don't expect many neutron star collisions in this vicinity: maybe one every 3 years or so. The first science run didn't see any, and the set an upper limit of about 170 per year: the best experimental upper limit so far, but definitely worth improving, and nowhere near as fun as actually seeing gravitational waves. But Jorge said the LIGO team has now reached its goals: they should be able to see collisions out to 15 megaparsecs! By comparison, the center of the Virgo cluster is about 20 megaparsecs away. In fact, they should already be able to see about half the galaxies in this cluster. One can tell this is the South. The massive construction caused pools of water to form in the boggy land near the facility, and these pools then attracted alligators. These have been dealt with firmly. The game hunters who occasionally fired potshots at the facility were treated more forgivingly: instead of feeding them to the alligators, the LIGO folks threw a big party and invited everyone from the local hunting club. Hospitality works wonders down here. The place was pretty lonely. During the week lots of scientists work here, but this was Saturday, and on weekends there's just a skeleton crew of two. There's usually not much to do now that the experiment is up and running. As Joe Giaime later said, there have been no "Jodie Foster moments" like in the movie Contact, where the scientists on duty suddenly see a signal, turn on the suspenseful background music, and phone the President. There's just too much data analysis required to see any signal in real time: data from both Livingston and Hanford is sent to Caltech, and then people grind away at it. So, about the most exciting thing that happens is when the occasional tiny earthquake throws the laser beam out of phase lock. One of them had brought his sons, in a feeble attempt to dispose of the huge supply of Halloween candy that had somehow collected here. I also got to see a sample of the 400 "optical baffles" which have been installed to absorb light spreading out from the main beam before it can bounce back in and screw things up. The interesting thing is that these baffles and their placement were personally designed by Kip Thorne and some other godlike LIGO figure. Moral: unless they've gone soft, even bigshot physicists like to actually think about physics now and then, not just manage enormous teams. Oh well. I'm glad I don't need to understand this stuff in detail. It was fun to get a peek. This is a gentler introduction to higher gauge theory than my previous talks, some of which I inflicted on you in "week235". It explains how BF theory can be seen as a higher gauge theory, and briefly touches on Urs Schreiber's work towards exhibiting Chern-Simons theory and 11-dimensional supergravity as higher gauge theories. The webpage has links to more details. It's full of pictures and animations - fun for the whole family! I started with the Pythagorean fascination with the pentagram, and how you can use the pentagram to give a magical picture proof of the irrationality of the golden ratio. I then mentioned how Plato used four of the so-called Platonic solids to serve as atoms of the four elements - earth, air, water and fire - leaving the inconvenient fifth solid, the dodecahedron, to play the role of the heavenly sphere. This is what computer scientists call a "kludge" - an awkard solution to a pressing problem. Yes, there are twelve constellations in the Zodiac - but unfortunately, they're arranged quite differently than the faces of the dodecahedron. This somehow led to the notion of the dodecahedron as an atom of "aether" or "quintessence" - a fifth element constituting the heavenly bodies. If you've ever seen the science fiction movie The Fifth Element, now you know where the title came from! But once upon a time, this idea was quite respectable. It shows up as late as Kepler's Mysterium Cosmographicum, written in 1596. I then went on to discuss the 120-cell, which gives a way of chopping a spherical universe into 120 dodecahedra. 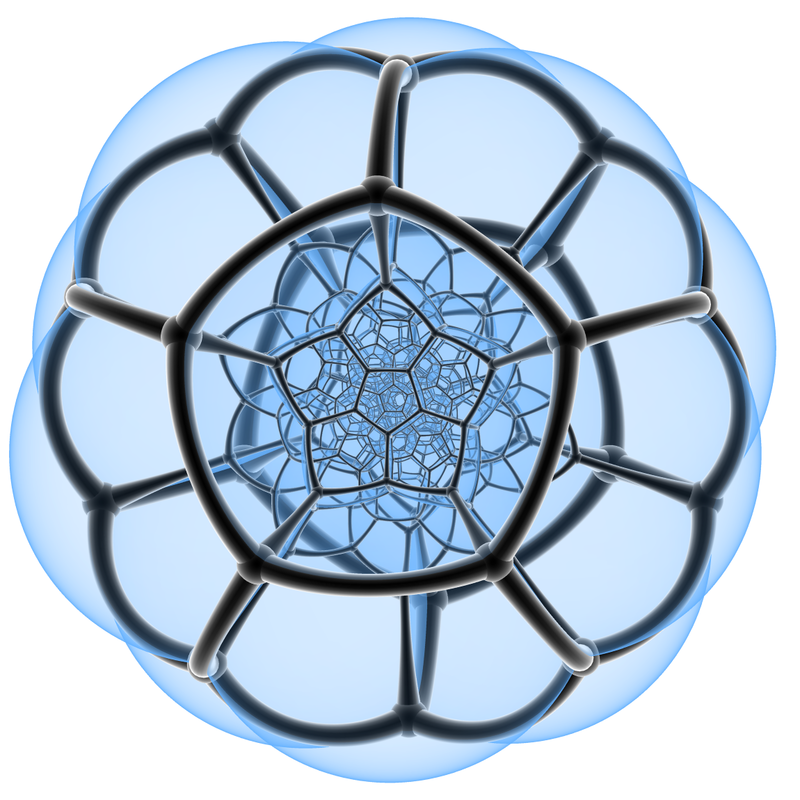 This leads naturally to the Poincare homology sphere, a closely related 3-dimensional manifold made by gluing together opposite sides of one dodecahedron. 5) J.-P. Luminet, J. Weeks, A. Riazuelo, R. Lehoucq, and J.-P. Uzan, Dodecahedral space topology as an explanation for weak wide-angle temperature correlations in the cosmic microwave background, Nature 425 (2003), 593. Also available as astro-ph/0310253. The idea is that if we lived in a Poincare homology sphere, we'd see several images of each very distant point in the universe. So, any ripple in the background radiation would repeat some minimum number of times: the lowest-frequency ripples would be suppressed. 6) Neil J. Cornish, David N. Spergel, Glenn D. Starkman and Eiichiro Komatsu, Constraining the topology of the universe, Phys. Rev. Lett. 92 (2004) 201302. Also available as astro-ph/0310233. In the abstract of my talk, I made the mistake of saying that the regular dodecahedron doesn't appear in nature - that instead, it was invented by the Pythagoreans. You should never say things like this unless you want to get corrected! The first black line is 100 angstroms long (10-8 meters), while the second is 50 angstroms long. 10) Robert J. Ternansky, Douglas W. Balogh and Leo A. Paquette, Dodecahedrane, J. Am. Chem. Soc. 104 (1982), 4503-4504. So, there's probably a bit somewhere in our galaxy. Of course, what I meant was that people didn't come up with regular dodecahedra after seeing them in nature - that instead, the Pythagoreans dreamt them up, possibly after seeing pyrite crystals that look sort of similar. These crystals are called "pyritohedra". But, even here I made a mistake. The Pythagoreans seem not to have been the first to discover the dodecahedron. John McKay told me that stone spheres with Platonic solids carved on them have been found in Scotland, dating back to around 2000 BC! 13) Michael Atiyah and Paul Sutcliffe, Polyhedra in physics, chemistry and geometry, available as math-ph/0303071. Indeed, stone balls with geometric patterns on them have been found throughout Scotland, and occasionally Ireland and northern England. They date from the Late Neolithic to the Early Bronze age: 2500 BC to 1500 BC. For comparison, the megaliths at Stonehenge go back to 2500-2100 BC. Nobody knows what these stone balls were used for, though the article by Marshall presents a number of interesting speculations. If your webbrowswer can handle Java, go to this webpage and click on "Pyrite no. 3" to see a rotating pyritohedron. Then, while holding your left mouse button down when the cursor is over the picture of the pyritohedron, type "m" to see the vectors listed above. Why "m"? These vectors are called "Miller indices". In general, Miller indices are outwards-pointing vectors orthogonal to the faces of a crystal; we can use them to classify crystals. The Miller indices for the pyritohedron have a nice property. If you think of these 12 vectors as points in space, they're the corners of three 2×1 rectangles: a rectangle in the xy plane, a rectangle in the xz plane, and a rectangle in the yz plane. Apparently iron pyrite can also form a pseudoicosahedron - see "Pyrite No. 7" on the mindat.org website above. Does anyone have actual photos? Since the pseudoicosahedron does a cheap imitation of this trick, with the number 2 replacing the golden ratio, the number 2 deserves to be called the "fool's golden ratio". I thank Carl Brannen for explaining this out to me! The regular docahedron is "dual" to the regular icosahedron: the vertices of the icosahedron are Miller indices for the dodecahedron. Similarly, I bet the pyritohedron is dual to the pseudoicosahedron. So, we could call the pyritohedron the "fool's dodecahedron", and the pseudoicosahedron the "fool's icosahedron". Fool's gold may have fooled the Greeks into inventing the regular dodecahedron, by giving them an example of a fool's dodecahedron. where A and B are the nth and (n+1)st Fibonacci numbers, respectively. As n → ∞, these dodecahedra approach a regular dodecahedron in shape, because the ratio of successive Fibonacci numbers approaches the golden ratio. When A = 1 and B = 2, we get the fool's dodecahedron, since only a fool would think 2/1 is the golden ratio. So, the rhombic dodecahedron deserves to be called the "moron's dodecahedron" - at least for people who think it's actually a regular dodecahedron. These are normal to the faces of a cube. So, the cube deserves to be called the "half-wit's dodecahedron": it doesn't even have 12 faces, just 6. The A = 1, B = 2 pyritohedron is figure 9, while the A = 2, B = 3 pyritohedron is figure 12. It's noticeably better! Let me wrap up by mentioning a fancier aspect of the dodecahedron which has been intriguing me lately. I already mentioned it in "week230", but in such a general setting that it may have whizzed by too fast. Let's slow down a bit and enjoy it. The rotational symmetries of the dodecahedron form a 60-element subgroup of the rotation group SO(3). So, the "double cover" of the rotational symmetry group of the dodecahedron is a 120-element subgroup of SU(2). This is called the "binary dodecahedral group". Let's call it G.
The group SU(2) is topologically a 3-sphere, so G acts as left translations on this 3-sphere, and we can use a dodecahedron sitting in the 3-sphere as a fundamental domain for this action. This gives the 120-cell. The quotient SU(2)/G is the Poincare homology sphere! where the spheres intersect when there's an edge between the corresponding dots. And, this diagram is the Dynkin diagram for the exceptional Lie group E8! which yields, by the same procedure as above, a cobordism from the empty set to the 3-manifold SU(2)/G. I don't fully understand this stuff, that's for sure. But, I want to. The Platonic solids are still full of mysteries. While perusing a Nature issue I found this short notice on a paper, and I remembered that in your talk (which I saw online) you mentioned that the dodecahedron was not found in nature. Now I see in "week241" that there are some things dodecahedral after all, but nevertheless, I send this further dodecahedron which was missing there. 15) The complete Plato, Nature 439 (26 January 2006), 372-373. According to Plato, the heavenly ether and the classical elements - earth, air, fire and water - were composed of atoms shaped like polyhedra whose faces are identical, regular polygons. Such shapes are now known as the Platonic solids, of which there are five: the tetrahedron, cube, octahedron, icosahedron and dodecahedron. Microscopic clusters of atoms have already been identified with all of these shapes except the last. Now, researchers led by José Luis Rodríguez-López of the Institute for Scientific and Technological Research of San Luis Potosé in Mexico and Miguel José-Yacamén of the University of Texas, Austin, complete the set. They find that clusters of a gold-palladium alloy about two nanometres across can adopt a dodecahedral shape. 16) Juan Martín Montejano-Carrizales, José Luis Rodríguez-López, Umapada Pal, Mario Miki-Yoshida and Miguel José-Yacamán, The completion of the Platonic atomic polyhedra: the dodecahedron, Small, 2 (2006), 351-355. Binary AuPd nanoparticles in the 1-2 nm size range are synthesized. Through HREM imaging, a dodecahedral atomic growth pattern of five fold axis is identified in the round shaped (85%) particles. Our results demonstrate the first experimental evidence of this Platonic atomic solid at this size range of metallic nanoparticles. Stability of such Platonic structures are validated through theoretical calculations. Either there is some additional value in the construction, or the authors (and Nature editors) were unaware of dodecahedrane. Dodecahedrane is a molecule built from carbon and hydrogen - a bit different from an "atomic cluster" of the sort discussed here. It's a matter of taste whether that's important, but I bet these gold-palladium nanoparticles occur in nature, while dodecahedrane seems to be unstable. They look a bit like Ernst Haeckel's pictures from his book "Kunstformen der Natur" (artforms of nature). You can read a bunch of freewheeling discussions triggered by this Week's Finds at the n-Category Café.